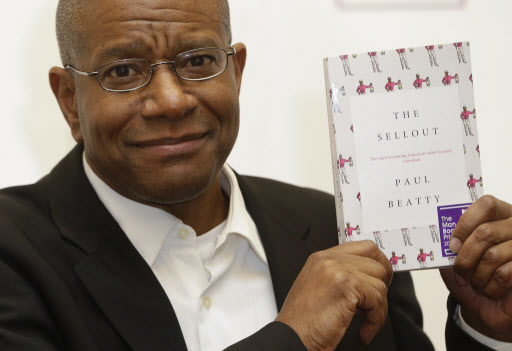 LONDON (AFP) -- Paul Beatty has become the first US author to win the Man Booker Prize for his novel “The Sellout,” which the novelist said should not be read as a “mono-directional” take on race. The jury behind the world’s most prestigious English-language literary award said the novel was a “shocking and unexpectedly funny” portrayal of Beatty’s native Los Angeles, using satire to explore racial equality in a fictional neighborhood. Beatty said readers should think of the novel as a work of fiction rather than solely focusing on race. “I tend to bristle when people say it’s black, it’s angry, it’s about race,” he told journalists after picking up the award at a glitzy black-tie ceremony in London’s historic Guildhall building Tuesday. “Hopefully it’s not so mono-directional. “These labels are more malleable than we like to think about them,” the 54-year-old writer said. Beatty appeared overwhelmed when he took to the stage to receive the award from Prince Charles’s wife Camilla. “I can’t tell you guys how long a journey this has been for me,” he said. The winner of the Man Booker receives 52,500 pounds ($64,100), although the real prize is seen as the huge sales prompted the moment judges announce their decision. The Man Booker was launched in 1969 and has awarded writers including Ian McEwan, Iris Murdoch and Salman Rushdie. It was only opened to non-Commonwealth authors from 2013 -- a decision that was highly controversial in Britain. No US author had won it until now, despite concerns that writers from the United States would dominate the prize. Jury Chair Amanda Foreman said nationality had nothing to do with the choice. “It did not weigh on the jury that Paul was American,” said Foreman, who herself is American and based in New York. “It shows that there is a global reach to this prize,” she added. “The Sellout” is Beatty’s fourth novel and earlier this year won the National Book Critics Circle Award in the US. It is narrated by Bonbon, an African-American resident of the run-down town of Dickens in Los Angeles county, which has been removed from the map to save California from embarrassment. Bonbon is on trial for attempting to reinstitute slavery and segregation in the local high school as a means of bringing about civic order. Five other authors were nominated for the prize in a shortlist celebrated for taking risks and tackling tough subjects. The favorite had been Canadian Madeleine Thien with her third novel, “Do not say We Have Nothing,” a weighty 480-page book that portrays a young woman recounting her family’s past in revolutionary China. British author Graeme Macrae Burnet’s “His Bloody Project” had also been tipped by bookmakers. His second novel is set in 19th-century rural Scotland and tells the story of a young and poor tenant farmer who murders the village administrator and his family. The book’s Glasgow-based publisher is run by just two people and is struggling to meet demand. Other novels shortlisted include “Hot Milk” by South African-born British author Deborah Levy, who depicts a torturous relationship between mother and daughter in a Spanish village. Canadian-British author David Szalay’s “All That Man Is” traverses different countries to follow the lives of nine men in a tale about contemporary Europe. The final shortlisted book “Eileen,” the debut novel by American Ottessa Moshfegh, follows a disturbed young woman who cares for her alcoholic father and works in a youth prison.